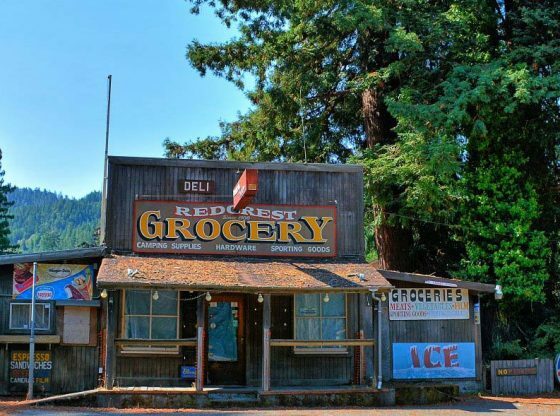 Watch any old movie about rural life, cow towns, farming, or homesteading, and you are bound to see at least one episode taking place in the local General Store. The TV series Green Acres featured Drucker’s General Store, while for an earlier generation, the radio duo “Lum and Abner” made their fictional living, not very well, in the Pine Ridge, Arkansas, Jot Em Down Store. There were two competing General Stores in the fictional Dodge City of the Gunsmoke series. Growing up on these images, I never questioned that General Stores had once existed—or that they were a thing of the past. But there are some elements of the General Store concept that have survived and others that, sadly, have passed away in the mists of time. I recently came across a fascinating book—Pills, Petticoats, and Plows: The Southern Country Store , by Thomas D. Clark, a Mississippi historian—that revived my reverie about the General Store and made me want to give the whole notion of a store that sold “notions” another look. Clark’s book is centered in the southern United States in the late 1800s to early 1900s. This is partly because of his own interest in that region, but partly because after the Civil War, the South had greater need of the General Store, owing to the devastation of cities, train lines, and communications that made commerce tough in the Reconstruction years. Being where the people were was a basic factor in the establishment of the General Store. Before the General Store, and after, came the tinkers, the traveling salesmen, the carnival barkers. These fellows went from tiny town to tiny town, even from homestead to homestead, drumming up business (hence their nickname, drummers) wherever they could. As Clark suggests, people on a lonely farm would move the furniture aside to invite these gents into the parlor. Their salesmanship was a kind of show, and their goods were often real necessities for folks who lived far from any trading post. Then, as towns grew up or were, as in the South, rebuilding, and railroad lines came through or were restored, the General Store had a lengthy heyday. The general-ness of the store was part of its charm, but also part of its vital necessity. 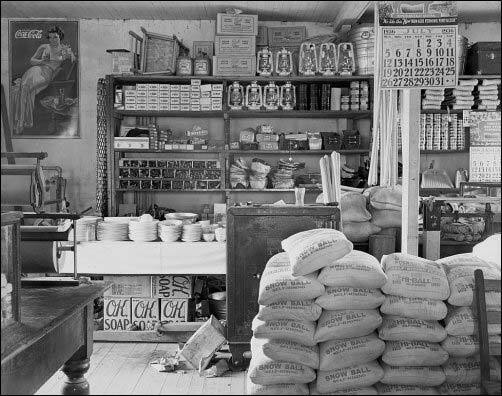 Merchants were few, merchandise supplies were spotty at best when the General Stores were in their prime. But the stores were there to provide whatever the locals needed. But supplying the locals was not a one-way proposition, because the farmers and homesteaders also supplied the General Store. My husband talked to an old fellow who had run such a store years before, and was told that folks would bring in everything from eggs to live chickens, a spare bucket of milk, any surplus produce, and sell or barter with the merchant, who had to be willing to take such provender at any time from the community that supported his business. This result of all this merchandise moving, restacking, restocking, and changing with the farming seasons was a crowded but homey sense of comfort. The homey atmosphere was enhanced by the need to keep the large, often cavernous, building warm. So there would be a woodstove right in the middle of the room. Gradually chairs, sometimes rocking chairs, were added, and cheap snacks like soda crackers were offered in barrels near the chairs so that customers could “come on in and set a spell.” As Clark says, “Fox races, tobacco, cotton, horses, women, politics, religion—no subject is barred from the most serious and light-hearted conversation.” Most stores included a porch, or wooden sidewalk at the least so that when the weather was warm, folks could meet and greet outside, catch the breeze in the pre-AC days, and have “a chaw and a jaw” before loading up their wagons and going home. But What’s Really Going On? According to Clark, the General Stores of the post Civil-War era, up until the 1940s in some places, might offer the following services, purvey the following goods, or perform the following functions: banking and credit, shoe fitting, post office, money orders, community meetings, political rallies, evangelism, message sending, gun sales, whiskey sales, pharmacy, dairy, toys, clothing for all sizes and needs from denims to laces, town telephone, town news center, flour, sledgehammers, ribbons, needles, mule harness, entire buggies including the whips, pencils, perfume, and opium—and a stage for drummers to hawk their wares and tell the latest off-color stories. As Clark notes, if a woman saw a traveling salesman’s wagon out front, she’d know better than to go in the General Store, where likely there would be a crowd of men gathered around the drummer, trading rude but hilarious jokes from all over. The General Store evolved with the times. As mentioned, the merchant might have the only telephone in town and thus become the universal messenger or the center of the local party line. The foodstuffs sold reflected the local diet: meat, fatback, cornbread, molasses, and biscuits comprised the staple Southern country fare, as Clark says, “three times a day and fifty-two weeks a year.” Older folks in our Mayberry region well recall that regimen, and some still crave those foods and eat them happily at the local diners. Since the schoolhouses grew up around the same time as the stores came to town, the General Store put paper, pencils, and school-worthy clothing out each fall. And, speaking of clothes, “a family of six required four bolts of cloth annually in order to provide changes of clothing around.” But by the 1920s, catalogs and newspapers from up north were showing ready-made clothing that was cheap and saved a lot of woman-hours, so the General Store had to keep up by ordering factory-made trousers, underwear, overalls, and a wide variety of hats. By the turn of the century, too, there were store-bought bottles of medicines to replace home and herbal remedies. Along with alcohol, the aforementioned opium was an ingredient in numerous drops and syrups for pains and agues, touted by carneys and snake-oil salesmen and often “manufactured” in the back room of a city drugstore (or under a carnival tent). These so-called “patent medicines” had wild and wonderful names: Phyto-Gingerin, Dr. King’s New Discovery, Dr. Roc’s Rheumatic and Neuralgic Cure, McGill’s Nerve Food Powders, and Howe’s Arabian Tonic. I found myself wishing that today’s medicines had such creative nomenclature! As can be imagined, gradually clothes became more style-conscious, food more seasonal, cars replaced buggies and oxen and mules, and the towns were growing. Some became cities or found themselves near to larger burgs where “specialty shops” were creeping in. You could buy hats in a haberdasher, corsets in a ladies clothing boutique, and canned and fresh foods in that new “grocery” store. Sure, you couldn’t write up an order and have it waiting for you, and there were no woodstoves—but you were changing, too—you didn’t want to be thought of as a hick or bumpkin or hillbilly or redneck anymore. Kids were going to large public schools with more than one classroom, they wanted the latest goods, too—bicycles, Lincoln logs, and their own radios. Clark’s book was written around 1944. That was a time when the General Stores were fading fast in the new prosperity of the Post-War years. By the 1950’s, the General Stores were breathing their last. Folks could go to the newly proliferating “five and dime” stores downtown, to chain stores and big box “marts” (you know what I’m talking about). Though the quality of goods in a General Store might have sometimes been questionable—whatever flimsy lamp or scarf a fast-talking hawker could foist on the merchant—there were also necessities like hardware that were put together by people who knew how to use them, and bought by people who insisted on excellent craftsmanship. In the “marts” of today, as we all know, goods come from abroad, and the emphasis is on low price, not high quality. To be fair, though, some of the smaller “dollar” stores have tapped into the basic principle of the General Store: be where the people are. Get them in before they get to town. That convenience factor and the wide variety of merchandise under one roof, while it may lack the warm fuzziness of the old-time stores, is still a boon to folks in rural areas. But importantly, a few real General Stores never quite died, or have staged a comeback. At the Mast General Store in Valle Crucis, NC, started in the 1880s, you can buy coffee for a nickel and mail a letter from the store post office, just like in the olden days. In Pemberton, Ohio, you can visit Beeker’s General Store and purchase such arcane foods as “Amish wedding granola.” Jefferson General Store in Jefferson, Texas, features an old-fashioned soda fountain and homemade pralines (yu-um!). 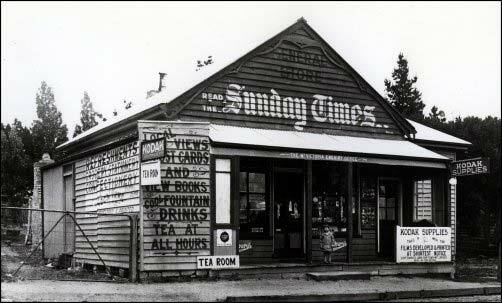 A little research will probably reveal a revitalized General Store somewhere within a day’s drive from where you live. The smell alone will entice—a mixture of herbs, candies, wooden barrels, local pickles, and honey, and fresh produce. My advice: take the kids or the grandkids for that day trip to a refurbished old General Store. Talk about the good old days. Offer them a soda fountain drink or some homemade candy if they agree to put their cellular devices away for an hour or two. They may not realize it right away, but they (and you) will fall under the spell. It’s irresistible.